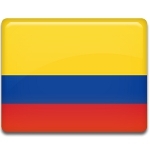 The Republic of Colombia annually celebrates its Independence Day on July 20. This holiday commemorates the day in 1810, when Colombia gained independence from Spain. Colonization of present-day Colombia began in the 16th century. Spanish founded their first city Santa Marta in 1525 and later started move along the Magdalena River. The Royal Audiencia was created in 1549 by a royal decree and New Granada was ruled by the Royal Audience of Santa Fe de Bogotá. At that time it was the territory of modern Colombia. In 1717 the Viceroyalty of New Granada was created, but it was temporarily removed. Later it was created again in 1739 and had Santa Fé de Bogotá as its capital. At the end of the 17th century the colonies in South America started the struggle for their independence. The movement was born in Haiti (then-St. Domingue), that declared independence in 1804. Colombia declared its independent from Spain on July 20, 1810, but officially it was recognized only in 1819. Day of declaration of independence is celebrated as national holiday in Colombia.